Our servo-hydraulic and rotating mass fatigue machines measure longitudinal strain and high-cycle fatigue properties at temperatures ranging from -320°F to 2400°F in various environments. Metcut uses its large number of testing machines for high production testing of a variety of sample geometries and materials in various environments. Standard test coupon geometries are M12 through M18, 7/16-UN through 3/4-UN and 0.4-in. through 0.75-in.-diameter buttonhead shank bars. We also provide sheet specimen strain control testing to 0.055-in. minimum thickness and 2000°F depending on material characteristics. Standard fatigue tests are conducted utilizing servo-hydraulic equipment conducted in constant strain or load amplitude control modes in accordance with ASTM E-606, and E-466. We conduct tests at 0.1- to 2-Hz. frequencies for longitudinal strain control tests, and 0.01- to 90-Hz. for axial load control tests. We also perform creep and stress relaxation tests in servo-hydraulic machines under very precise control from one to several hundred hours. Elevated temperature tests are conducted with either resistance furnaces or induction field generators, depending on the material characteristics. We conduct cryogenic tests at any temperature between 32°F and -320°F using liquid Nitrogen as a cooling medium. We routinely maintain test temperatures within the sample gage section at 1% of the test temperature. 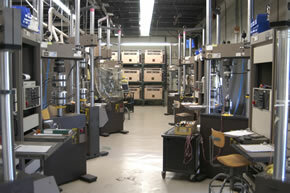 Several Sonntag universal test machines are available to conduct testing at high displacement amplitudes incurred during cantilever bending tests. R.R. Moore and Krouse rotating beam tests are available in four-point and cantilever bend modes at room and elevated temperatures.